McGhee, Robert. "Prehistory". The Canadian Encyclopedia, 30 March 2017, Historica Canada. https://www.thecanadianencyclopedia.ca/en/article/prehistory. Accessed 24 April 2019. 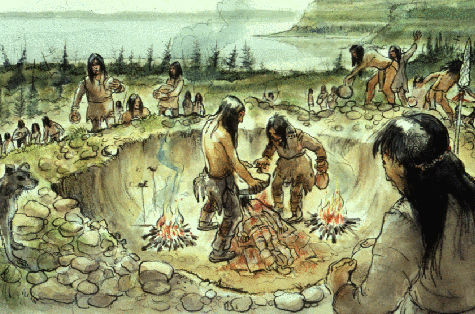 Prehistoric humans first arrived in significant numbers in what is now Canada about 12,000 years ago. They crossed an ancient land bridge between present-day Siberia and Alaska and spread steadily across the North American continent. Prehistoric humans first arrived in significant numbers in what is now Canada about 12,000 years ago. They crossed an ancient land bridge between present-day Siberia and Alaska and spread steadily across the North American continent. Over several millennia, they established villages and eventually farming and fishing economies. These were the forerunners of the Indigenous peoples who inhabited Canada at the time of first contact with Europeans. The first human occupants of Canada arrived during the last Ice Age, which began about 80,000 years ago and ended about 12,000 years ago. During much of this period almost all of Canada was covered by several hundred metres of glacial ice. The amount of water locked in the continental glaciers caused world sea levels to drop by more than 100 meters, creating land bridges in areas now covered by shallow seas. One such land bridge crossed what is now the Bering Sea, joining Siberia and Alaska by a flat plain more than 1,000 kilometers wide (see also Beringia). This plain moved large herbivores such as caribou, muskox, bison, horse and mammoth, and at some time during the ice age these animals were followed by human hunters who had adapted their way of life to the cold climates of northern latitudes. (courtesy Yukon Beringia Interpretive Centre). 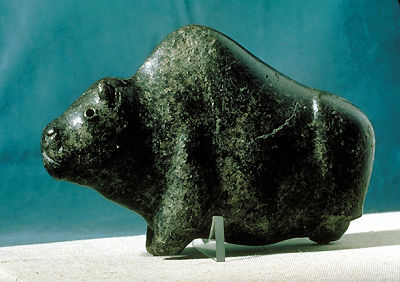 Stone, east-central Alberta, prehistoric (courtesy Glenbow Museum). There is continuing argument about the time of the first immigration to the New World. It was long thought that humans could not have reached the American continents until the end of the ice age. That's because it was thought that before the last major ice advance, 25,000 to 15,000 years ago, human cultures in the Old World had developed neither technologies capable of living in the cold Arctic conditions of northeast Asia, nor watercraft capable of crossing the open seas of a flooded Bering Strait. Recent research indicates, however, that humans had reached Australia across a wide stretch of open sea by at least 30,000 years ago, and that as long as 200,000 years ago the Palaeolithic (Old Stone Age) occupants of Europe were living under extremely cold environmental conditions and may have had watercraft capable of crossing the Strait of Gibraltar. It is theoretically possible, therefore, that humans could have reached North America from northeast Siberia at any time during the past 100,000 years. During the past few decades, several New World archaeological sites have been claimed to date to the period of the last ice age. The earliest widespread occupation of the Americas that is universally accepted by archaeologists, however, begins only 12,000 years ago. Much of Alaska and Yukon remained unglaciated throughout the ice age, probably because of a dry climate and insufficient snowfall (see also Nunatak). Joined to Siberia by the Beringian Plain, and separated from the rest of North America by glaciers, these regions, called Beringia, were essentially part of Asia. The environment was a cold tundra, although spruce forests were present at least during interstadial or nonglacial periods, and supported a wide range of animals. Archaeological finds along the Old Crow Basin in northern Yukon have been claimed to indicate the presence of Palaeolithic hunting populations in the period 25,000 to 30,000 years ago. However, all these objects have been found in redeposited sediments. Many of them may have been manufactured by things other than humans (such as carnivore chewing or ice movement), and the age of the few definitely man-made artifacts has been questioned. 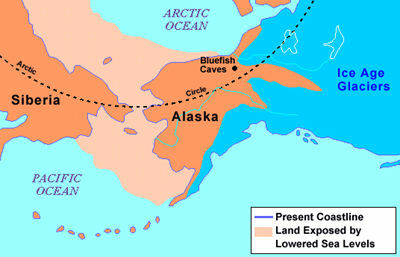 The archaeological site of the earliest accepted occupation by humans in the Americas is Bluefish Caves in north Yukon. Here, in three small caves overlooking a wide basin, a few chipped stone artifacts have been found in layers of sediment containing the bones of extinct fossil animals, which radiocarbon dating indicates have an age of at least 10,000 to 13,000 and possibly 15,000 to 18,000 years ago (see also Geological Dating). The artifacts include types similar to those of the late Palaeolithic of northeast Asia, and probably represent an expansion of Asian hunting peoples across Beringia and Alaska into northwestern Canada. We do not know whether people similar to those who occupied the Bluefish Caves expanded farther into North America. A relatively narrow ice-free corridor may have existed between the Cordilleran glaciers of the western mountains and the Laurentide ice sheet extending from the Canadian Shield, or such a corridor may have opened only after the glaciers began to melt and retreat about 15,000 years ago (see also Glaciation). Recent evidence suggests that another route may have been taken along the Pacific coast to the west of the Cordilleran glaciers. No early sites have been found along the route of these corridors, but by 12,000 years ago some groups had penetrated to the area of the western United States and had developed a way of life adapted to hunting the large herbivores that grazed the grasslands and ice-edge tundras of the period. By about 11,000 years ago some of the Palaeoindians, as they are known to archaeologists, began to move northward into Canada as the southern margin of the continental glaciers retreated. Environmental zones similar to those found today in Arctic and subarctic Canada shifted northward as well. In many regions the ice front was marked by huge meltwater lakes (e.g., Lake Agassiz), their outlets dammed by the glaciers to the north, surrounded by land supporting tundra vegetation grazed on by caribou, muskoxen and other herbivores. To the south of this narrow band of tundra were spruce forests and grasslands, and the Palaeoindians probably followed the northern edge of these zones as they moved across Canada. Palaeoindian sites are radiocarbon dated to around 10,500 years ago in areas as far separated as central Nova Scotia and northern British Columbia. The largest sites yet found in Canada are concentrated in southern Ontario, where they are clustered along the southern shore of Lake Algonquin, the forerunner of the present Lake Huron and Georgian Bay (see also Great Lakes). By about 10,000 years ago Palaeoindians had probably occupied at least the southern portions of all provinces except Newfoundland. Most sites are limited to scatters of chipped stone artifacts, among them spear points with a distinctive channel or "flute" removed from either side of the base to allow mounting in a split haft. 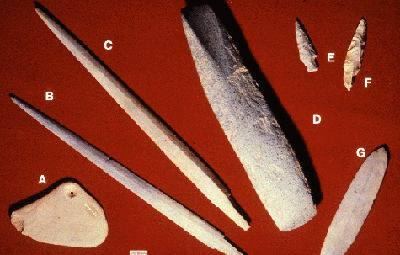 Such "fluted points" are characteristic of early Palaeoindian technologies from Canada to southern South America, and serve to define the first widespread occupation of the New World about 9,000 to 12,000 years ago. Because very little organic material is preserved on archaeological sites of this period, it is difficult to reconstruct the way of life that the Palaeoindians followed. In the dry western regions of the US, where sites are better preserved, they appear to have concentrated on hunting large herbivores, including bison and mammoths. In Canada we can only speculate that Palaeoindians preyed on the caribou herds of the east and the bison herds of the northern plains, as well as fishing and hunting small game. Coastlines were well below present sea level, so any evidence of Palaeoindian use of coastal resources has been destroyed by the later rise in sea level. While the Palaeoindians occupied southern Canada, the continental glaciers melted rapidly and disappeared by about 7,000 years ago. A warmer climate than the present existed until about 4,000 years ago, and the environments of the country diversified as coniferous forest, deciduous woodland, grassland and tundra vegetation became established in suitable zones. The ways of life of the Palaeoindians occupying these environmental zones became diversified as they, and later immigrants from Siberia, adapted to the conditions and resources of local regions. The development over time of the various cultures of prehistoric Indigenous peoples is therefore best described on a regional basis. 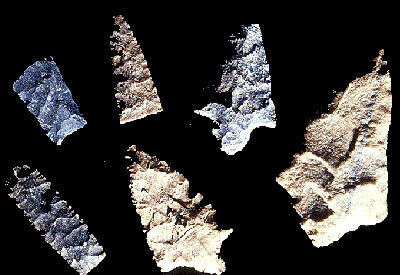 There is little evidence that the classic "fluted point" Palaeoindian cultures penetrated the coastal regions of British Columbia. The earliest occupants of the area appear to have been related to other cultural traditions. About 9,000 to 5,000 years ago the southern regions were occupied by people of the Old Cordilleran tradition, whose sites are marked by crude pebble tools made by knocking a few flakes from heavy beach cobbles and by more finely made lanceolate projectile points or knives chipped from stone. No organic material is preserved on these sites, but their locations suggest that these people were adapted primarily to interior and riverine resources, gradually making greater use of marine resources. The northern and central coast was occupied by people of the early Coast Microblade tradition, who also used pebble tools but lacked lanceolate points. Microblades are small razorlike tools of flint or obsidian made by a specialized technique developed in the Old World and were widely used during this period in Alaska and northwestern Canada. It is suggested that these people entered BC from the north and that they were related to Alaskan groups who may have crossed the Bering land bridge shortly before it disappeared. It is unclear how either of these two groups were related to those who occupied the West Coast after 5,000 years ago, but it seems likely that both contributed to the ancestry of the later occupants. At about 5,000 years ago a major change occurred in coastal occupation. Whereas earlier sites were all relatively small, indicating brief occupations by small groups of people, large shell middens, or human-made heaps, characterize most of the more recent sites. Stabilization of sea levels probably resulted in increased salmon stocks, which in turn allowed people to store more food and live a more sedentary life in coastal villages that were occupied for years or generations. Animal bones and bone tools have been preserved in the shell middens, and artifacts of wood or plant fibre appear in occasional waterlogged deposits, allowing archaeologists to reconstruct a more complete picture of the way of life of these people than of earlier occupants of the region. Artifacts recovered from the earliest sites indicate an efficient adaptation to the coastal environment. Barbed harpoons for taking sea mammals, fish hooks, weights for fish nets, ground slate knives and weapon points, and woodworking tools that could have been used for the construction of boats occur on coastal sites of the period. Waterlogged sites have produced examples of basketry, netting, woven fabrics and wooden boxes similar to those known from the historic period. By about 3,500 years ago there is evidence that this adaptation was beginning to lead to the development of the sophisticated societies known from the historic Northwest Coast. Burials that show differential treatment in the number of grave goods for members of the community, as well as the appearance in some regions of artificial skull deformation, suggest the existence of the ranked societies with which these practices were later associated. The high incidence of broken bones and skulls among male burials, coincidentally with the appearance of decorated clubs of stone or whalebone, suggests the development of a pattern of warfare. Social organizations based on status and wealth may also account for the appearance at this time of numerous art objects, personal ornaments such as beads, labrets and earspools, and exotic goods indicating widespread trade networks to the interior and the south. In the Strait of Georgia region, the Locarno Beach (3,500-2,500 years ago) and the Marpole (2,500-1,500 years ago) phases are seen as a local cultural climax, producing evidence of a richer culture than that which existed in the area in more recent times (see also Indigenous Art). A similar situation appears to have characterized most coastal regions during the past 1,500 years. This interpretation is based on the decline of the sculpted stone artwork that characterized the preceding period, perhaps indicating only a change from art in stone to art in wood and woven fabrics, which are poorly preserved archaeologically but were highly developed by the historic occupants of the region. This period produces the first definite evidence for occupation of the large plank-house villages characteristic of the historic period, and of major earthworks and defensive sites indicating an increase in warfare. Stone pipes mark the introduction of tobacco, the only agricultural crop grown in the area in prehistoric times. The people of the past 1,500 years developed the various tribal traditions and ways of life of the historic Northwest Coast Indigenous People. The valleys and plateaus of interior British Columbia are characterized by diverse environments ranging from boreal forests through grasslands to almost desert conditions. The prehistoric cultures of the area were correspondingly diverse and this variety, combined with the lack of sufficient archaeological research in the region, results in an unclear picture of the prehistory of the area. Finds of Palaeoindian projectile points and other artifacts indicate that the earliest occupants of the area came from the plains, adapting their grassland bison-hunting way of life to the pursuit of bison, wapiti and caribou in the intermontane valleys. Little is known of these people, but the skeleton of one man who died in a mudslide near Kamloops is radiocarbon dated to about 8,250 years ago and is thus the earliest well-dated human skeleton known from Canada. Analysis of the composition of the bones indicates that this man lived primarily on land animals rather than on the salmon of the Thompson River. Between 8,000 and 3,000 years ago the area appears to have been occupied by various groups who manufactured and used microblades and who are thought to have been related to the microblade-using peoples of the north coast or of the Yukon interior. The riverine location of many microblade sites suggests that these groups were developing adaptations based on the salmon resources of interior rivers, but little else is known. A major change in the occupation of the region began about 3,000 years ago, with the introduction of semi-subterranean pit houses from the Columbia Plateau to the south. Pit house villages grew larger through time, indicating a more efficient economy and an increasingly sedentary way of life. As in the coastal areas to the west, the appearance of exotic trade goods (shells), stone sculpture and differential burial patterns is interpreted as evidence of more complex societies in which ranking was based on wealth and display. Over the past 3,000 years cultural influences from the West Coast, the plains and the Columbia Plateau combined to form the cultures of the various interior people of BC (see also Indigenous People: Plateau). The northern plains and prairies of western Canada, like no other region of North America, provided an environment in which the descendants of the Palaeoindians of 10,000 years ago were able to continue their way of life with relatively little alteration until the time of European contact. As the large herbivores of the ice age became extinct in the early postglacial period, these people transferred their pursuit to the various species of now-extinct bison that occupied the grasslands. Although heavily dependent on bison, Palaeoindians and their later descendants must also have been hunters of smaller game and gatherers of plant foods where available. They almost certainly developed techniques of communal hunting involving ambush or the driving of bison to hunters armed with spears and darts thrown with throwing boards. Archaeology knows these people primarily through the chipped flint spearpoints that they used. By about 9,000 years ago their fluted projectile points had been replaced by lanceolate or stemmed varieties characteristic of the late Palaeoindian Plano tradition. Between approximately 9,000 and 7,000 years ago, the Plano people developed a widespread and apparently efficient bison-hunting adaptation across the northern plains. By at least 7,000 years ago caribou hunters using spearpoints obviously related to those of the Plano tradition had pushed northward to the Barren Lands between Great Bear Lake and Hudson Bay. The following two millennia on the northern plains, between approximately 7,000 and 5,000 years ago, are poorly known. This period saw the climax of the postglacial warm period or altithermal, and it is suggested that heat and drought reduced the carrying capacity of the grasslands so that the area was occupied by fewer bison and consequently by fewer bison hunters. Sites around the fringes of the plains, and some sites in the plains area itself, show continuing occupation, and the development of spearpoints with notches for hafting. Such points are characteristic of the following Middle Prehistoric period (approximately 5,000 to 2,000 years ago), during which various groups developed more efficient communal bison-hunting techniques, including the use of pounds and jumps, over which the bison were driven (see also Head-Smashed-In-Buffalo-Jump). The past 2,000 years saw the introduction to the plains area of various influences from the Eastern Woodlands and from the Mississippi and Missouri valley peoples to the south. During the early first millennium AD, small chipped stone arrow points began to replace the spearpoints of earlier times, and the introduction of the bow must have increased hunting efficiency. Pottery cooking vessels and containers of types similar to those in use to the east and south were used. 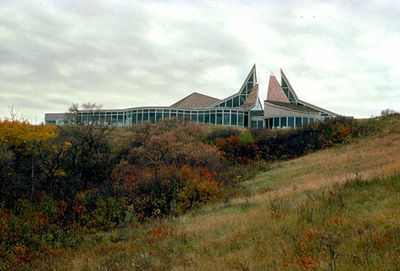 Burial mounds were constructed in some regions, especially in southern Manitoba (see also Linear Mounds Archaeological Site), and exotic trade goods indicate contacts with the farming people of the Missouri Valley. Although most of the northern plains was beyond the limit of prehistoric agriculture, relatively small-scale farming was attempted in the more southerly regions. The westward push of European settlement in the 18th century caused a rapid acceleration of change in prehistoric plains life, as tribes from the eastern woodlands began to move westward onto the grasslands. Horses, which had gradually spread northward from the Spanish settlements in the American southwest, reached the Canadian plains about 1730, causing a revolution in aboriginal techniques of hunting, travelling and warfare. For the next 150 years, until the disappearance of the bison in the late 19th century, the Canadian plains and prairies saw the development of a way of life that must have been dramatically richer, more nomadic and more varied than that of earlier occupants of the area. Early Palaeoindian hunters using fluted spear points had occupied southern Ontario, and probably the St. Lawrence Valley, by at least 10,000 years ago. With the draining of the large ice-edge lakes and seas of the region, the extinction of the ice-age fauna, and the establishment of coniferous forests, the environments of these regions changed dramatically during the following two millennia. The next occupation of the region was by late Palaeoindians using artifacts similar to those of the Plano tradition, which developed on the plains to the west. The best evidence for Plano occupation comes from the northern shores of lakes Superior and Huron, but Plano-related sites are known from the upper St. Lawrence Valley and as far east as the Gaspé Peninsula. These eastern Plano people of some 9,000 to 7,000 years ago were probably big-game hunters who were heavily dependent on caribou, the predominant herbivore in the subarctic forests of the period. The following millennia, with warmer climates and the establishment of deciduous forests, saw the development of Archaic cultures. The Archaic label is applied to cultures throughout eastern North America which show adaptations to the utilization of local animal, fish and plant resources, and which are consequently much more varied than the widespread but relatively uniform Palaeoindian cultures that preceded them. These adaptations probably allowed increases in the populations of many areas, and greater social complexity is suggested by complex burial practices and the existence of long-distance trade. The Archaic stage is also marked archaeologically by the development of new items of technology: stemmed and notched spear points and knives, bone harpoons, ground stone weapon points and woodworking tools (gouges, axes), and in some areas tools and ornaments made from native copper. Some of the most important artifacts in the study of prehistory are stone points such as these, lanceolate-triangular point, small-stemmed point and stemmed point (courtesy CMC/K75-946). The Plano people of 6000-9000 years ago were so named because they were first identified on the Great Plains. Shown here are Plano spear points from diverse areas of NB and NS (courtesy CMC). A major technological innovation occurring at this time (3000-6000 years ago) was a well-developed ground stone industry. These objects, from Spednik Lakes, NB, include a stone weight for nets, stone projectiles and gouges and ground slate cutting knives (courtesy CMC). From the Cow Point site illustrating the implements and decorative objects characteristic of the Maritime Archaic culture (drilled stone pendant, ground slate bayonets, stone adze, flaked stone lance points, and slate spear) (courtesy CMC). From Northern Labrador. 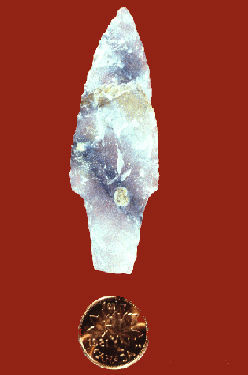 Spear or dart point made by Maritime Archaic people of a translucent grey stone, called Ramah chert, containing manganese (courtesy Memorial U of Newfoundland). The Canadian Shield area of central and northern Québec and Ontario was occupied at this time by groups belonging to the Shield Archaic culture. They apparently developed about 7,000 years ago out of northern Plano cultures such as those which occupied the Barren Grounds west of Hudson Bay, or those known from northwestern Ontario. Since the acid forest soils of the region have destroyed all organic remains, we know relatively little of their way of life. From the locations of their camps, however, they were probably generalized hunters heavily dependent on caribou and fish. Although pottery and other elements were introduced from the south over the past 3,000 years, marking the Woodland period of local prehistory, it seems likely that the Archaic way of life remained relatively unchanged and was much like that of the Algonquian peoples of this area at the time of European contact and the beginning of the fur trade. The deciduous forest areas to the south supported denser populations than the spruce forests to the north and saw the development, about 6,000 years ago, of the Laurentian Archaic, probably from earlier Archaic cultures of the area. These people were generalized hunters and gatherers of the relatively abundant animal and plant resources of the region. Exotic materials such as copper and marine shells, most often found as grave goods in an elaborate burial ceremonial, indicate extensive trade contacts to the south, east and west. The appearance of pottery, introduced from areas south of the Great Lakes between 3,000 and 2,500 years ago, is used archaeologically to mark the beginning of the Woodland period. As in the regions to the north, the initial Woodland period probably saw few changes in the general way of life of local peoples. During the following centuries, however, there is evidence of continuing and expanding influence from the south, including an elaborate mortuary complex involving mound burial, which appears to have been transferred, or at least copied, from the Adena and Hopewell cultures of the Ohio Valley (see also Rainy River Burial Mounds). The most important introduction was agriculture, based on crops that had been developed in Mexico and Central America several millennia previously, and which had gradually spread northward as they were adapted to cooler climatic conditions. The first crop to appear was maize, or corn, which began to be cultivated in southern Ontario about 1,500 years ago and was a major supplement to a hunting and gathering economy. The early maize farmers occupied relatively permanent villages of multifamily wood and bark houses, often fortified with palisades as protection from the warfare that appears to have intensified with the introduction of agriculture. By 1,350 CE beans and squash were added to local agriculture, providing a nutritionally balanced diet that led to a decrease in the importance of hunting and gathering of wild foods (see also Indigenous Peoples: Uses of Plants). At the time of European contact this agricultural lifestyle was characteristic of the Iroquoian peoples who occupied the region from southwestern Ontario to the middle St. Lawrence Valley. It is the only region of Canada in which prehistoric agriculture was established as the local economic base, and was the area of greatest aboriginal population density. The late prehistoric Iroquoians lived in villages composed of large multi-family longhouses, with some of the larger communities containing more than 2,000 people. Wide-ranging social, trade and political connections spanned their area of occupation, as a complement to the warfare which occupied much of their attention. These patterns intensified with the appearance of Europeans and European trade goods during the 17th century, and eventually led to the destruction of the Canadian Iroquois during the mid-17th century at the hands of their Iroquois neighbours to the south of Lake Ontario. Maritime provinces by at least 10,000 years ago, but evidence of their presence is slight as sea levels were much lower than at present and only traces of interior camps can be found above present sea level. The same problem restricts our knowledge of early Archaic sites, although we can probably assume that there was continuous occupation throughout this period, as there was in the Eastern Woodlands area to the west. The best evidence of early Archaic occupation is found in the Strait of Belle Isle area of Labrador where initial occupation occurred before 8,000 years ago and is marked by chipped stone artifacts suggesting a late Palaeoindian/Archaic transition. The coastal location of these early Archaic sites suggests a maritime adaptation, an interpretation reinforced by the 7,500-year-old mound at L'Anse Amour Site in which was found a toggling harpoon, a walrus tusk and an artifact of walrus ivory. The term Maritime Archaic is applied to these people and their descendants. Artist's reconstruction. The body of the child has been placed face down and head to the west. A single large rock is about to be placed on the child's back, which is being sprinkled with red ochre (courtesy CMC). Coastal hunting and fishing allowed Maritime Archaic people to expand to far northern Labrador by 6,000 years ago, and to Newfoundland by about 5,000 years ago. For the following 2,000 years they were the primary occupants of these areas, developing a distinctive maritime way of life with barbed harpoons, fishing gear, ground-slate weapons and ground-stone woodworking tools. Maritime Archaic people also elaborated a mortuary complex in which large cemeteries were used over considerable lengths of time, the burials accompanied by large numbers of grave goods and heavily sprinkled with red ochre. Cemeteries of this type are found in the Maritime provinces and New England. Similarities in burial traditions, artifacts and the physical type of the skeletons suggest relationships to the contemporaneous Laurentian Archaic of the Eastern Woodlands, and it seems likely that Laurentian people occupied some regions of the Maritime provinces. Between 4,000 and 2,500 years ago the Maritime Archaic people were displaced from most of coastal Labrador by a southward expansion of Palaeoeskimos from the Arctic, and by other Archaic groups moving eastward from the Shield area and the St Lawrence Valley. The Dorset Palaeoeskimos also occupied Newfoundland for about a millennium, beginning about 2,500 years ago. With the withdrawal of the Palaeoeskimos from Newfoundland and all but northern Labrador about 1,500 years ago, these areas were re-occupied by people who were probably ancestral to the Labrador/Innu and Newfoundland Beothuk. We do not know whether these were the descendants of earlier Maritime Archaic people, or of other groups that moved to the area at a later time. In the Maritime provinces to the south of the Gulf of St Lawrence, the past 2,500 years saw the introduction of ceramics from the south and the west. The possible extent of other cultural influences is suggested by the 2,300-year-old Augustine burial mound in New Brunswick, which duplicates the Adena burial ceremonialism of the Ohio Valley and includes artifacts imported from that region. Early in this period local groups apparently began to develop a more sedentary way of life, as shell middens began to accumulate in some coastal regions. Evidence from these sites indicates a generalized hunting and fishing way of life, utilizing both coastal and interior resources. This lifestyle was characteristic of Atlantic Canada at European contact, and the sites dating to the past 2,000 years almost certainly represent those of the ancestral Mi'kmaq and Maliseet peoples. The forest and forest-tundra area between Hudson Bay and Alaska is, archaeologically, one of the least-explored regions of Canada. Although the far northwest of the region has produced evidence of extremely early human occupation, later developments are only vaguely known. In the area to the west of the Mackenzie River there is thought to be evidence of two distinct early postglacial occupations dating between 11,000 and 7,000 years ago. One is by groups related to the Palaeoindians of more southerly regions, and marked by lanceolate spearpoints. 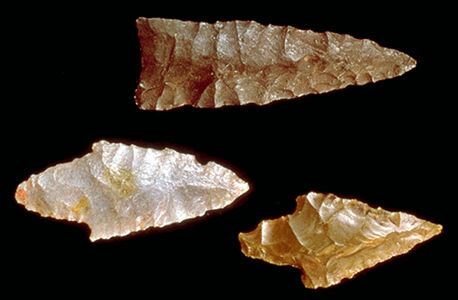 Probably the earliest Palaeoindians to occupy the area used fluted points, since a few such artifacts are known from Alaska and Yukon. However, these finds have not been dated earlier than the fluted point sites to the south, so it is still uncertain whether they represent the original movement of Palaeoindians to the south or a subsequent return movement northward. Somewhat more recent occupations are marked by spearpoints which relate either to the late Palaeoindian Plano tradition of the northern Plains, or to the Old Cordilleran tradition of British Columbia and the western US. The second major occupation is by groups related to the Palaeoarctic tradition of Alaska, a people whose microblade technology is derived from eastern Asia and who are thought to have crossed the Bering land bridge. It is unclear how these early occupations relate to those of the Northern Archaic, which was present in the area from about 6,000 to at least 2,000 years ago. 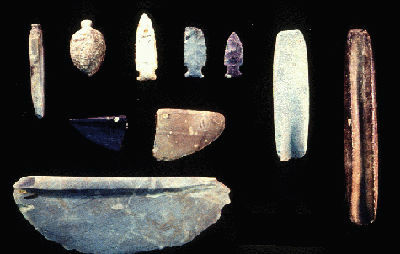 This culture is characterized by notched spearpoints and other elements of apparent southern origin, but at least the early sites of the period also produce microblades, and microblades may have been in use in some regions until close to the end of this period. Neither is it known how the Northern Archaic relates to the ancestry of the Dene-speaking peoples who occupied interior northwest Canada. Definite ancestral Dene sites can be traced for only about the past 1,500 years in this area. This may represent an intrusion of Dene from elsewhere, or continous development out of the Northern Archaic of earlier times. The earliest occupation of the region between Mackenzie River and Hudson Bay was by Plano-tradition people who moved into the Barren Grounds from the south shortly before 7,000 years ago. Notched spearpoints and other types of stone tools from at least 6,000 years ago led to the definition of the Shield Archaic tradition. It seems that the Shield Archaic developed locally out of Plano culture, rather than representing an intrusion of people from the south, and there was little change in the way of life followed by local groups. The Barren Grounds continued to be occupied by Shield Archaic Indigenous peoples until about 3,500 years ago when, perhaps in response to climatic cooling that caused the treeline to shift southward, the region was taken over by Palaeoeskimos from the Arctic coast (see also Climate Change). This occupation lasted for less than 1,000 years, when people using various forms of lanceolate and stemmed spearpoints, and later arrow points, reoccupied the territory. The origin of these groups is not clear, but they probably moved into the Barren Grounds from the south and west, and may have arrived at various times between 2,500 and 1,000 years ago. At least the more recent of these prehistoric groups were ancestral to the Dene-speaking occupants of the historic period, who led a caribou-hunting way of life not greatly different from that of the Plano and Shield Archaic peoples of much earlier times. The coasts and islands of Arctic Canada were first occupied about 4,000 years ago by groups known as Palaeoeskimos. Their technology and way of life differed considerably from those of known American Indigenous groups and more closely resembled those of eastern Siberian peoples. 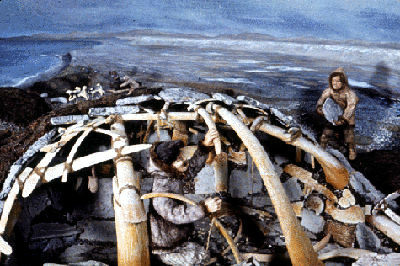 Although there is disagreement among archaeologists on the question of Palaeoeskimo origins, it seems likely that the Palaeoeskimos crossed Bering Strait from Siberia, either by boat or on the sea ice, shortly before 4,000 years ago, and rapidly spread eastward across the unoccupied tundra regions of Alaska, Canada and Greenland. These early occupants seem to have preferred areas where they could live largely on caribou and muskox, but were also capable of harpooning seals and in some areas adapted to a maritime way of life. Early Palaeoeskimo technology, based on tiny chipped flint tools including microblades, was much less efficient than that of the historic Inuit occupants of the region. There is no evidence that they used boats, dogsleds, oil lamps or domed snowhouses, as they lived through most or all of the year in skin tents heated with fires of bones and scarce wood. Nevertheless, between 4,000 and 3,000 years ago they occupied most Arctic regions and had expanded southwards across the Barren Grounds and down the Labrador coast, displacing indigenous occupants. After about 2,500 years ago the Palaeoeskimo way of life had developed to the extent that it is given a new label, the Dorset Culture. There is slight evidence that the Dorset people used kayaks and had dogs for hunting if not for pulling sledges; soapstone lamps and pots appear, as well as semi-permanent winter houses banked with turf for insulation. Dorset sites are larger than those of their predecessors, suggesting more permanent occupation by larger groups, and in some regions it is apparent that the Dorset people were efficient hunters of sea mammals as large as walrus and beluga. A striking art form was developed in the form of small carvings in wood and ivory (see also Inuit Art). It was the Dorset people who, around 2,500 years ago, moved southward to Newfoundland and occupied the island for about 1,000 years. The Dorset occupation of Arctic Canada was brought to an end between 1,000 and 500 years ago, with the movement into the area of Thule Culture Inuit peoples from Alaska. Over the preceding 3,000 years these ancestors of the Inuit, who were probably descended from Alaskan Palaeoeskimos, had developed very efficient sea-mammal hunting techniques involving harpoon float and drag equipment, as well as kayaks and large, open skin boats from which they could hunt whales. The Thule movement across the Arctic, during a relatively warm climatic period when there was probably a decrease in sea ice and an increase in whale populations, occurred rapidly. Travelling by skin boat and dogsled, by 1,200 CE they had established an essentially Alaskan way of life over much of Arctic Canada and displaced the Dorset people from most regions. In Greenland and in the eastern Canadian Arctic they soon came into contact with the Norse, who had arrived in Greenland about 980 AD. Norse artifacts have been recovered from several Thule sites. The Thule way of life, characterized by summer open-water hunting and the storage of food for use during winter occupation of permanent stone and turf winter houses, became more difficult after 1,200 CE as the arctic climate cooled, culminating in the Little Ice Age of 1600 to 1850 AD. During this period many elements of their way of life had to be changed, and the Thule people either abandoned portions of the Arctic or rapidly adapted to the new conditions. During the same period, contact with European sailors, whalers and traders (see also Basque, History of Commercial Fisheries), and the impact of European diseases may have been as important as climate change in altering the traditional Thule way of life. It was during this late prehistoric period that much of the culture of the historic Inuit was developed. Knut R. Fladmark, British Columbia Prehistory (1986); J. Jennings, Prehistory of North America (1968) and, ed, Ancient Native Americans (1978); Robert McGhee, Canadian Arctic Prehistory (1978); J.A. Tuck, Newfoundland and Labrador Prehistory (1976); J.V. Wright, Six Chapters of Canada's Prehistory (1976), Ontario Prehistory (1972) and Quebec Prehistory (1979). Archaeological ParksImages of Parks Canada archaeological excavations featuring shipwrecks, agricultural sites and early settlements.